Zenyatta’s filly, right, on the first day riding in the field. Photo by April Mayberry. Zenyatta’s 2017 Medaglia d’Oro filly is settled in at Mayberry Farm. 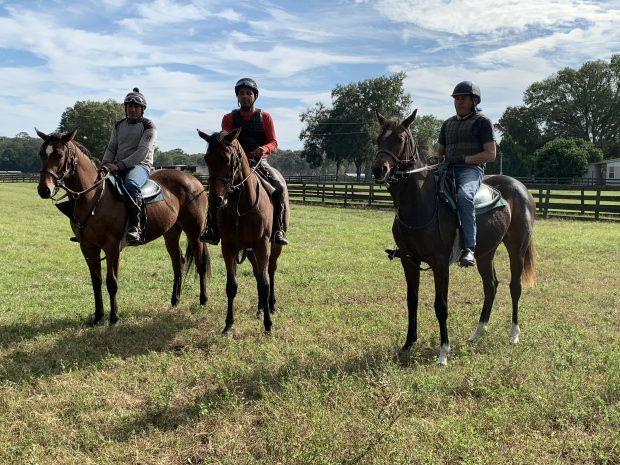 Like her mother and two older brothers before her, she’s in early training under Jeanne Mayberry in Ocala, Florida. 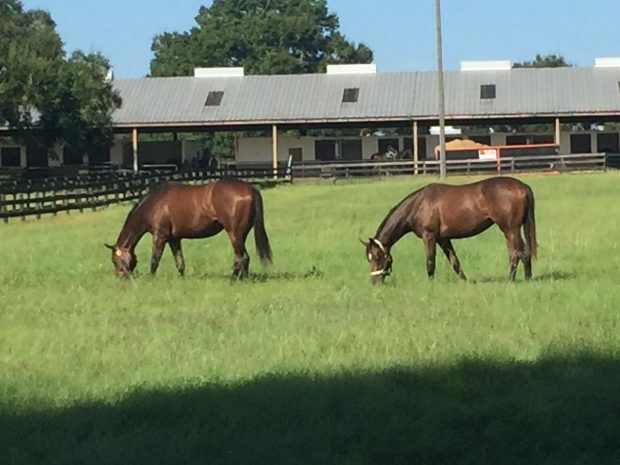 Zenyatta’s filly, right, with her paddock mate. Photo by April Mayberry. Jeanne reports that she’s doing well in her lessons and spending afternoons in the pasture with a girlfriend that she traveled with from Lane’s End. Below, 17Z leads the pack during their first ride in the field. More horse news. AP enjoying himself before returning to America.He looks wonderful. THANK YOU for the update on Zenyatta’s filly! Loved watching the video. Nice article with photos on Biscuits and the Yoshida family’s hopes for him as a sire. I wish Biscuits the best of luck in Japan,Thanks for sharing.Love and hugs. Thanks so much for these articles! The Man o’ War second installment is just as fascinating as the first — I don’t think we will see the likes of him again. So good to know that Biscuits is loved and has a home back here, maybe in Chad Summers’ backyard! 😍 He is such a handsome chestnut boy. Good luck in Japan, Biscuits! You have been missed and this is why. Over the years, I have so enjoyed your knowledgeable and informative posts on Euros and other horses. Your discussions with Sheena back and forth and the links of articles and videos that you post. You two are so well informed about horses, trainers and jockeys in the UK and Ireland, I have learned so much from both of you. I miss the fun discussions we had about retiring at Lane’s End; discussions about Big Red, Dynaformer, Wise Dan, Danzig, The Dancer and so many others. The funny conversations about bad boy Charlie the Blanket Bandit and Hudson the Diva. I miss the phone calls between Gun and Biscuits, and I know I’m not alone in that. I miss our shared joy in Zenyatta and the bond we shared through the experience of her sad losses. There is an old saying: there is still a lot of horse sense in this world, but the horses have most of it. This site used to be an inclusive, happy place, a sanctuary from the nastiness lurking everywhere on this earth. Politics as complex as the second amendment really should have no profile at all here. From your comments, the plan is to keep commenting “once in a while.” Once is just too often. I therefore ride off permanently into the sunset. So very sorry to lose you as a friend. Respect your decision. As bad as it gets at times, horses never give up on their humans. Horses are very forgiving and teach us to be humble, loving, forgiving. So, guess what, it is a trail ride today. Full of new adventures, thrills and spills. Hold on tight, turn around and share your delightful horse knowledge with us. Please! Moose demands your return. reason why they set it up was lost to political bickering. This just isn’t the place; it’s a place of peace and love, especially our love for horses and other animals. That’s just how I feel, and I think others too. Another horse I love a beautiful photo of Rachel Alexandra. Wow! I have not been on for a day or so and was very surprised by some of the posts. I love this blog and all the people on it. We all love Zenyatta and her “kids” but it has been wonderful to hear about and learn of other horses. This is where I first heard the name Winx! Of course, we stray from the subject once in awhile but I have never felt that I was being chased off by anything anyone said. You have never been anything but kind and loving. Keep it up. Peace and Joy to all during this holiday season. Some predictions about possible Eclipse winners for all horse lovers. Hope all of you all are reading Steve Haskins articles on Man O War. Thanks for posting the possible Eclipse winners. I agree with most of them. Even though he won the Triple Crown, I am still a bit lukewarm about Justify. I just wish he had raced later in the year. But really cannot think of an American horse other than him. Too bad Winx and Enable can’t be in it. Dark Flame tucked in for the night. The most wonderful package arrived yesterday. Your beautiful face, drawn by the talented, Matt, looks gorgeous on the new T-shirts. Can’t wait to get my order! So glad you got yours before Christmas, neighbor. Yay!! Mine came today! The pink is brighter than I thought, but that’s ok-everyone will notice this great picture of Zenyatta drawn by Matt. Thank you, Matt & Team Z! Such good news about Graham and for his BFF Subbie too. Thank you for both of these articles. I am elated to hear the good test results for Graham and happy also for Subzero! Merry Christmas to all of them!! Enjoyed reading about the new sires and their potential. I must say Sharp Azteca is a handsome hunk, and Funtastic looks “greyt”, too. Both at Three Chimneys. Wow, what a great article with videos. Magnificent specimens, every one. Wishing them all happy, healthy lives as successful sires. Thank you for sharing this. Thank you for the update on Z17. She looks wonderful. Happy New Year, Team Z.
I’ve been following this blog since its inception (a “lurker” I guess), but have never posted. The tragedies with this mare’s breeding career have been heartbreaking. But I have held out hope for the babies that have made it. But this video made me feel pretty depressed about that. I spent my early years starting the babies and prepping 2yo’s for the track and a decade galloping at tracks from Monmouth to Hollywood Park. It makes me cringe to see this guy on the back of 17Z “training” her. I haven’t been on here in a while and was shocked by some of the comments. I don’t know what’s been going on, but Zenyatta’s owners and the entire Team Z have been beyond nice for all of her fans by creating this website and sharing updates about her and her children. And this is a great place to learn about other horses from the members on here. However, they could take away this website and any updates on our beloved Zenyatta at any time. They have stated since day one that his is a family friendly website and that under no circumstances are people to be derogatory towards each other, leave bad/ugly/rude comments, etc. This website is not the place for politics, religion, personal attacks, etc. We should all be so grateful that Zenyatta’s Team has continued to share her with us. I’ve been through so many serious health problems and this website is where I come when I’m feeling really bad or down and need my beloved Zenyatta fix. So many of us love her so much. So for those that want to talk about politics or religion or other subjects that do not belong on this blog, there are plenty of other websites out there created for just those subjects. Please do not ruin it for the rest of us!!! I absolutely loved seeing photos and get information about Z17, now officially named Zellda per Equibase. She is a lovely filly and I cannot wait to learn more about her. Her temperament, likes and dislikes, etc. In looking at all the posts I only saw a very few about what this Site is all about. Zenyatta and her family. I am thankful for this Site and the information that we are able to get directly from those who love her most. It is nice to learn about other horses as I do so on a daily basis as I am a member of other sites that I share and learn so much from. This Site is for Zenyatta. I would suggest that the administrators of this Site would intervene and that we could all come to this Site and share information about Zenyatta and her family. There are separate blogs that have subjects where this other information can be addressed, but that should not be on the main site. I suggest that as on Beholder’s Site, that you post information about Zenyatta and visit the various other topics and sites and share there. Perhaps create a facebook page or website that addresses these other issues that you have elsewhere. This Site is Special to many fans of Zenyatta and we treasure and covet all information that we can get about her. Please make this site about Zenyatta and share all other information elsewhere as I know that is important to you, as I do on other sites. It is important to fans to keep this Site all about our special girl and her family. She means a lot to all of us.